Known for his eclectic, inventive, yet approachable dishes, Shane McAnelly has a culinary approach distinctly focused on ingredients and seasonality. Growing up in the tight-knit community of Oakley, CA, Shane spent time as a child baking with his mother and grandmother, mastering the art of cheesecake at the age of 13. In 2005, he took a Sous Chef position at Garibaldi’s restaurant in Oakland, developing the menu to reflect Bay Area seasonality and building relationships with local farmers and purveyors. Rounding out his experience with a position in San Francisco, he took an Executive Sous Chef post with the opening team at Zero Zero under Bruce Hill in July 2010, managing the team and developing the ingredient-driven pizza and pasta-focused menu. 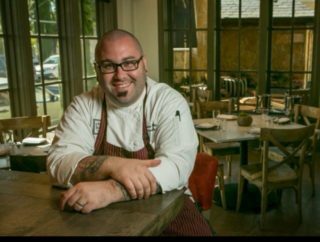 In April 2011, Shane took on his first Executive Chef position at Va de Vi restaurant in Walnut Creek, named a Bay Area Top 100 restaurant by the San Francisco Chronicle, and which remained on the list for the duration of his time there. After two years, he set his sights north, relocating with his wife and baby to open Chalkboard restaurant in downtown Healdsburg. Joining the town’s vibrant—and growing—culinary community as Executive Chef at the restaurant, Shane has been involved in every aspect of bringing Chalkboard to life: creating a bright, modern space for diners, collaborating with a gardener on a dedicated restaurant garden, and developing a menu that’s reflective of his years invested in cooking the best ingredients that the Bay Area has to offer. PreviousTom Schmidt | John Ash & Co.